Brainstorming defines the quantity of usage of brain to generate ideas to solve a specific problem. Since decades people have been using the brainstorming tool to generate ideas and to come up with creative solutions to problems. However, you need to use brainstorming correctly, to make it fully effective. Brainstorming combines a relaxed, informal approach to a problem solving method with lateral thinking. Brain storming encourages people to come up with innovative ideas that may seem a bit crazy in the beginning. Some of these ideas can be crafted into original, creative solutions to a problem, while others can spark even more ideas. The common principle of brainstorming is to set aside the restrictive thinking process generate constructive ideas. Brainstorming is required in technical field in everyday work, where people come up with requirement and require appropriate solution from technical person. To give them best solution technical person need to brainstorm on their requirement. Why & When to Use Brainstorming? 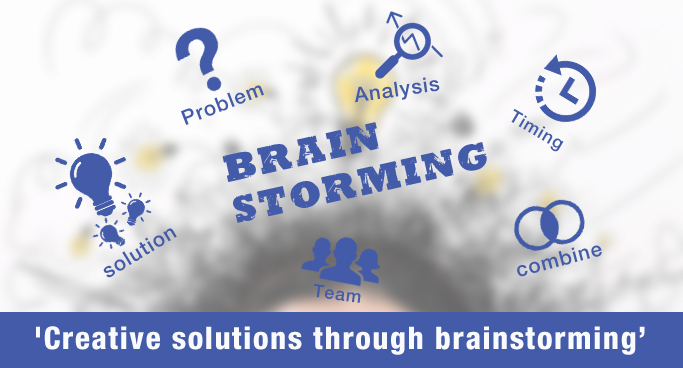 We can use brainstorming to solve all kinds of problems in various work areas such as: business, public administration, military, education process, family, management etc. It can also help you get buy-in from team members for the solution chosen – after all, they’re likely to be more committed to an approach if they were involved in developing it. What’s more, because brainstorming is fun, it helps team members bond, as they solve problems in a positive and rewarding environment. By contrast, brainstorming provides a free and open environment that encourages everyone to participate. Quirky ideas are welcomed and built upon, and all participants are encouraged to contribute fully, helping them develop a rich array of creative solutions. Developing the solution definition, particularly in identifying alternative solutions. Identifying all potential risks on a project. Developing the Work Breakdown Structure (identifying all the deliverables and work items). Dealing with difficult problems that arise during the course of the project. Before you begin a brainstorming session on a project, you should have to think ‘what is your Goal or what you want to achieve’ out of this brainstorming session. Identify the goal by understanding the requirement of the project and identify ‘what client need to develop and for whom the system will be developed’. This gives a good kick-off for the brainstorming session. Never initiate a brainstorming session without identifying the Goal. Otherwise you are setting yourself up for a phenomenal waste of time. After identifying the goals, understand the requirements clearly, before you start the brain storming session. Moreover it is advised to get the intended output from your teacher, boss, client or someone who can evaluate your work. By knowing the expectations, you can draw a thin boundary to start with a good framework. While Brainstorming jot down each and every single idea, even single words /phrases related to your topic/project comes in your mind. Organized the list of ideas into groups and select best idea that suits better for your project. Mind mapping is one of the most common tools to develop creative ideas. You can use mind maps to address creative challenges. Mind mapping visualization engenders ideas that are connected to a central topic. A mind map is web-like structure where the creative ideas are connected with one another or tied loosely. Connect these smaller ideas to generate master idea. Mind map only can identify all major modules and sub-modules of any project and also identify system flow. Also it will help to identify in which section you can face problem. Everyone knows that productive brainstorming sessions are imperative to present the problem in your group. The focus of the sessions must be on quantity of ideas rather than quality with the group having multidisciplinary participation. Members must be invited to build on ideas of other members to get the conversation flowing. It will help to bring hidden ideas and thoughts to the forefront to drive the solution. Gap Analysis is a brainstorming method that is commonly used in the business world. Whether you realize it consciously or not, the actual problem you’re struggling with is a gap. In gap analysis you have to identify in which point you are facing problem and what is your goal. Then only you can find the solution and brainstorm on that section only. Before starting Brainstorming you have to do some research on what and how the people work /worked on similar type of projects, what are the solutions available in current market etc. This exercise is to get new innovative ideas and not to follow already implemented ideas. Learn on how they devised the solution. Brainstorming will help you generate radical solutions to problems. You can also encourage people to commit to solutions, because they have provided input and contributed to the development. The best approach combines individual and group brainstorming. Do not encourage the criticism of ideas, and creativity. Learn to respect each single idea in the group. As the famous saying ‘drop drop makes the ocean’, smaller, creative ideas make the REAL change.